When I saw Martha Stewart’s recipe for Asian Turkey Meatballs, I didn’t just bookmark them, I made them immediately. Like that night. I’ve been obsessed with turkey meatballs lately and make these at least once a month. But these had something else going for them: Sriracha. I was thrilled to find a bottle of the real stuff in the Asian specialty store in Jerusalem since my husband puts it on everything, breakfast, lunch, and dinner. This simple but genius recipe calls for Sriracha in the meatballs along with bread crumbs, fresh cilantro, scallions, fish sauce, and sesame oil. The result is a super flavorful meatball with a nice (but not unbearable) kick. Those needing more can put additional Sriracha on the meatballs. My husband did! Although five years ago Sriracha – also called Rooster Sauce – was virtually unheard of, it has long since reached absolute cult status with every food publication offering recipes and uses for this addictive condiment. A paste made from chili and garlic, Sriracha is well balanced with a pleasant heat that makes it well suited for a number of applications. There’s a great article from 2009 about its origin in the New York Times for those who want to read up on it. I made a number of changes to the original recipe, from using white meat turkey only to solely baking (instead of frying then baking) the meatballs. I’ve made them twice this way and have been exceptionally happy with the results both times. Next I’ve got my eyes on these beauties from The Meatball Shop’s new cookbook. Made with all white meat and baked, these Sriracha Turkey Meatballs are super flavorful without lots of fat and calories. Combine breadcrumbs and hot water in a medium bowl and allow to sit for 5 minutes. Add ground turkey, scallions, cilantro, fish sauce, Sriracha, sugar, and sesame oil and thoroughly combine. Form into 18 to 20 meatballs and put on a baking sheet. Put in the oven. Bake for 10 minutes and turn the meatballs. Bake for another 10, or until cooked through. I have that NY Times article about Siracha bookmarked too! These look like a lot of fun. I like meatballs, a lot, but for some reason rarely make them. But I’m intrigued by the seasonings you use. And it’s a good use of turkey. Fun recipe – thanks. It’s a great article, isn’t it! I love the story behind Sriracha. The seasonings in these meatballs really are wonderful. I love turkey meatballs, and that you include both breadcrumbs AND sriracha makes my heart skip! 😉 Looks very, very tasty. 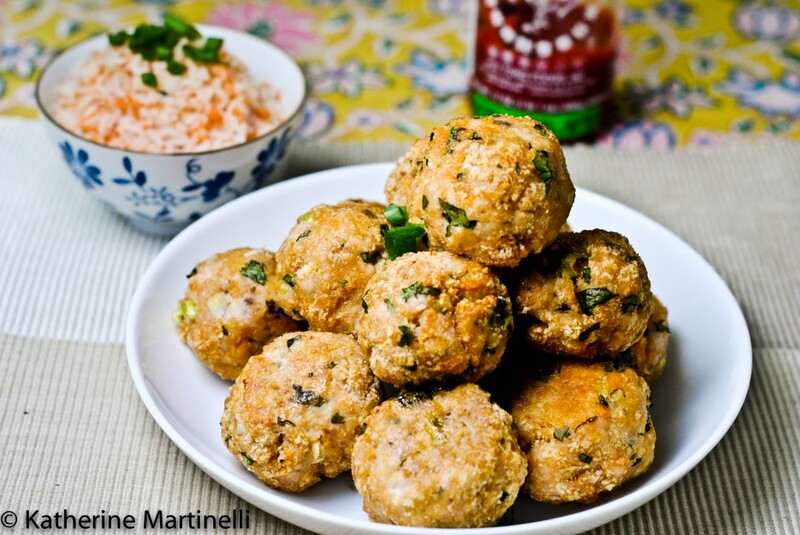 Its so hard for me to stray from the date turkey meatballs but I may have to try these. I love sriracha. Sriracha, in a meatball? My husband would die. In a good way. Haha I know right?! If he loves sriracha as much as my husband he will definitely love these. I’m going to pick up the ingredients next time I’m at the store. These look really interesting! Wow, these look great and the best part is that they are baked!!! Thanks Asmita! I’ve been so into baked meatballs lately – they’re so good and healthy! Sometimes I see recipes using ground turkey that have way to many ingredients. I guess there is a great effort going on to try and kick the blandness. Your use of asian flavors I know is the answer! The fish sauce and sriracha do stand up well in any kind of preparation. No doubt these are delicious-yum! I know what you mean! I actually like the flavor of turkey so don’t feel too much need to mask it. But I think these flavors don’t overwhelm anything. Thanks Tina! We loooove Sriracha in our house. These definitely sound like a winner to me! In my long, long life I have never ever made turkey meatballs. I will rectify this error at once! I know where I can find Sriracha too, so I’m good to go! Oh, these are fantastic! I’m a HUGE meatball fan…and honey bunny just requested some meatballs! What do you call that?….KISMIT! Believe it or not, I’ve never had sriracha before. Thank you for telling me it has a nice balance of flavors and isn’t crazy hot – that’s what’s kept me away from it. I’m off to read the NYTimes article! I recently purchased my first bottle of Sriracha the other day! My partner eats it like it is going out of fashion. Thanks for the recipe, I am going to try this out on the weekend! Hurrah! Very exciting 🙂 I know, my husband is the same way! He puts it on scrambled eggs in the morning and on chicken at dinner – on everything! It is great stuff. I hope you enjoy the recipe! First I’ve heard of Sriracha–you made me Google it! I often make turkey meatballs, but have never baked them. Haha glad to introduce you to this lovely ingredient 🙂 I’ve really enjoyed baking turkey meatballs lately, I feel that much healthier. They can be a tad drier than typical meatballs but still excellent. I don’t love turkey meat, but I thing I could go crazy for these meatballs! I bet these would be great with ground chicken as well! I wonder how Sriracha and beef meatballs would be? I have a fresh bottle of Sriracha with these meatballs name written all over it. Bookmarked! My second son is like your husband. He wants hot sauce on everything. Sriracha is his first choice, but he will take a Louisiana hot sauce as a substitution. I am more of a spice wimp. A few drops go a long way for my palate. These meatballs sound wonderful with the Asian flavors. Yes, my husband will also accept Frank’s and Tabasco, but Sriracha is his first choice as well! I like some nice heat, but I don’t want to burn my tongue off either. I’m sure your husband – and even you, they’re not that spicy – will love these! I only recently made my first turkey meatballs and I agree with you: they are amazing. This asian spin on them must be delicious! Aren’t they great?! I could eat these every day! Two tbsp. of Sriracha sounds like a lot, but I’ll take your word for it. I do like spicy, but Sriracha can sometimes be too hot, but with an absolutely wonderful flavor. These meatballs look quite delicious! I will be giving them a try! Honestly they weren’t all that spicy – 2 tablespoons in 2 pounds of meat goes a long way and it mellows a bit. If you’re nervous about it being too spicy you can always cut back on the Sriracha. It just needs a bit for the flavor, and all the other flavors are wonderful too. 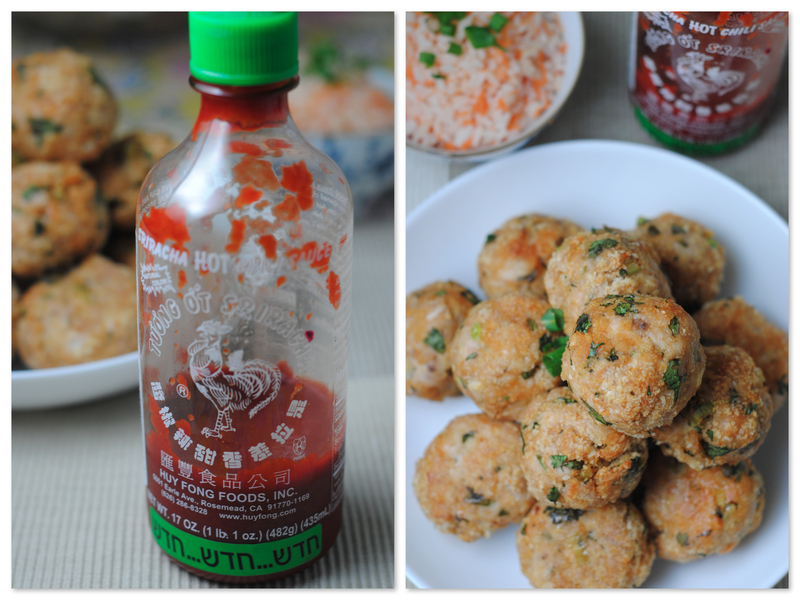 Thank you for sharing this recipe – we love spice and are addicted to sriracha! I’ll be making these meatballs this weekend. Perfect food for a snowy day, or any day! You are so welcome Hannah!! I hope you enjoyed them 🙂 I remember seeing that recipe on Food52, I really need to try it – thanks for the reminder! Although sriracha is too spicy for me to eat, my husband love this brand so much and he goes crazy. Well, he won’t put it in Japanese food but he uses for all kinds of Asian food. Your turkey meatballs must be delicious with the spice! These sound delicious! Curious what everyone has been eating these with? Not sure how to serve them — never actually made meatballs before. Thanks! Thank you so much!! Ooooh Sriracha grilled shrimp sounds amazing – love it on burgers, so I bet I’d love it in them too! Hi – I tried to make these meatballs and bought 1 lb of white meat ground turkey (Empire brand) and cut everything in half. I couldn’t form them into meatballs. They were like mush. I checked and did everything 1/2. So I had to add more bread crumbs until I could form them a little. I can’t imagine what I did wrong. Hi Karen – I’m sorry the meatballs didn’t come out! I think the main issue is probably with the ground turkey itself. Was it kind of mushy to begin with? Since I’ve been back in the States I’ve noticed that packaged ground turkey here is often quite weird and mushy, not at all the texture of freshly ground meat. Adding more bread crumbs was a good solution – hopefully they ended up edible? Thanks for your reply. You are right – the white meat ground turkey (Empire) is very soft to start off with, so I guess the only solution would be some sort of bread or rice to make it more workable. Other than changing the brand, I can’t think of any other way. I will say, once I added a bunch of crumbs and baked it, the taste was really nice but didn’t have as much of a kick because I had so many bread crumbs that I had to add. If anyone has any other suggestions, I am open to them.